Conserve, recycle, renew! 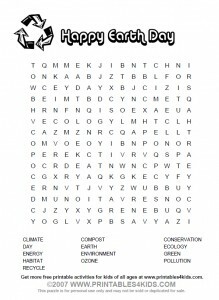 Earth Day is April 22 this year and we have created a word search puzzle for the occasion. Click on the image above to view and print full size or download the Earth Day Word Search as a PDF file. Don’t forget to check out the rest of our list of the best Earth Day printables. i cant download your earthday wordsearch/HELP. Ellen – do you have Adobe Reader installed? It is a free program that you can find at http://www.adobe.com that will allow you to download and print all of the activities on this site.